Almost no one I speak to in the offline world knows there’s another Star Wars film this year. But there is. The first of the standalone spinoffs. Here’s the trailer for Rogue One: A Star Wars Story, starring Felicity Jones (The Theory of Everything) and directed by Gareth Edwards (Godzilla). It’s great seeing the tech and look of 1977 recreated with the modern ‘sheen’, the visuals of the Star Destroyer leaving the Death Star are fantastic (though I’m not sure the laser plate would have been fitted like a windscreen). Mon Mothma looks spot on (played by Genevieve O’Reilly, reprising her role from Episode III, thank you George). Yes it’s going to be lots of fun to have a modern film set so firmly around the New Hope era, even if it will inevitably erode it a bit. There’s no question it’s a good plotline to explore too – following the rebels who steal the Death Star plans. In the trailer you get a glimpse of, presumably, Darth Vader with the Emperor’s Royal Guard (above). Given he starts A New Hope chasing the stolen plans, there’s little doubt he will be involved here. The only question is if he’s a background figure or active participant prior to the theft. Expect a big Vader reveal in the second trailer either way. 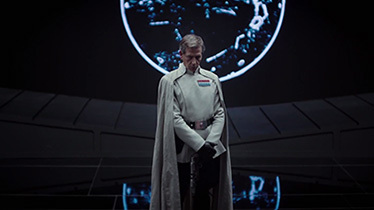 At first glance it seems obvious that main villain Ben Mendelsohn (who looks like a younger Peter Cushing) is playing Governor Tarkin. But according to the internet, events here are too close to New Hope for him to be the right age, and he’s likely a lower ranking admiral. We’ll see. Is Felicity Jones’ Jyn Erso the mother of Rey? I’d be extra excited if it wasn’t from director Gareth Edwards, who made Godzilla underwhelming with poor suspense timing and uninteresting lead characters. Rogue One: A Star Wars Story also stars Diego Luna, Riz Ahmed, Donnie Yen, Forest Whitaker, Mads Mikkelsen and Alan Tudyk. It’ll be released on December 16 this year in the UK and US. Episode XIII lands Christmas next year. It looks pretty good, but are they going to destroy a death star in every film from now on? Well it probably won’t blow up… But there will be a lot of people talking about it blowing up. Also I’m guessing as a declared standalone film it’ll be the biggest lead character bloodbath in Star Wars yet. – Gotta tie up those loose ends in case they mess with the post-Death Star timeline. This one looks good, but so did Godzilla. The Force Awakens was a bit too Return to Oz for me. Very excited for this one. I want to know who’s in that bacta tank! Good call. If it is Vader in the cloak then perhaps he is about to get in the empty-looking tank to heal wounds, he has a few. But then he kneels before it – there’s only one person he’d kneel for. Considering the tank’s flanked by the Emperor’s guards as well, it can only be Ian McDiarmid in there. I’ve got to admit I always see these sorts of extensions of franchises as separate entities to the original films. A bit like when someone writes a sequel of Gone with the Wind or whatnot. I apply the same logic to a lot of old films if the creative teams are fundamentally different. It’s that based on characters inspired by thing. For me Alien is a separate thing to the AU, except at a push Prometheus, and Halloween is a different universe after Season of the Witch. Obviously, it’s different with comic book movies because they have a sort soap-opera like running thread built into them from the outset. However, even then there are alternative universe versions. Having said that, this still looks good and the fact that it’s a stand alone movie is an encouraging sign.